Having built a steady following as a sideman in some of Houston’s top jazz clubs, 1980 saw Kirk stepping out in faith and starting his own band. Houston was such a cool music town in the early ‘80s. There were so many live music venues then..everybody came through Houston. I have memories of hanging out with Sonny Stitt and Rollins.. I was like a spongejust sitting there with these giants and absorbing everything they threw my way. It worked. His musical reputation as well as his local following grew. Soon Kirk became the opening act for jazz shows that came to Houston and in 1983 he caught the ear of jazz pianist Bob James, who was so impressed with the young Whalum that two weeks later Kirk found himself in New York soloing on Bob’s album, Bob James 12. Kirk became a member of his touring band and eventually snagged a recording deal with Columbia Records. Kirk released five records while signed to Columbia, the first in 1985, Floppy Disk, introduced the still frequently requested tune, Kyle’s Smiles written for Kirk’s yet-to-be-born, son Kyle. But it was the 1995 release of Cache that put Kirk on the charts. That CD went to #1 and remained there for five weeks. Other releases on that label include And You Know That! The Promise and In This Life. In 1987 Kirk received a serendipitous phone call from jazz guitarist Larry Carlton. Larry had heard this warm, passionate sax on the radio in Los Angeles and traced it to its creator, Kirk. Larry had never heard of me, didn’t know who I was or where I was, but managed to track me down in Houston. Next thing I know, I’m headed to LA to record with him. It was during that recording that I decided to move to Los Angeles. Kirk soon became an in demand session player. The late 80’s and early 90’s saw Kirk recording and performing with Nancy Wilson, Al Jarreau, Luther Vandross, Barbara Streisand, Quincy Jones, and others. There were movie soundtrack recordings including; Boys in the Hood, Grand Canyon, The Prince of Tides and unforgettably, Whitney Houston’s 1993 release, The Bodyguard. Kirk says, I have so many fond memories my years spent touring with Whitney. Her powerful gift impacted me profoundly-much like the many gospel singers who influenced the both of us. I will always treasure being there to watch her make history time and time again. Kirk toured with Whitney for seven years, until 1997 and also served as the unofficial chaplain for her and the band. Through his very visible association as Whitney’s sax guy, he was constantly making new fans of people who might not otherwise have been introduced to his music. But Kirk had another passion. In 1979 I won a scholarship to study French at the Alliance Française in Paris, France. It was a dream come true and I vowed that I would live there some day. July of ’92 saw that dream become a reality when Kirk moved his family to France. Although that adventure was cut short by the unprecedented success of Whitney’s single, I Will Always Love You and the subsequent BODYGUARD TOUR, France and things French remain close to Kirk’s heart. Kirk began his relationship with Warner Bros. Records in 1996 when he and Bob James collaborated on Joined at the Hip and received a Grammy nomination for their effort. Kirk later signed with Warner Bros. and in ‘97 released his first solo album for that label, Colors, which was inspired by Kirk’s appreciation for cultural and musical diversity as well as his passion for racial reconciliation. 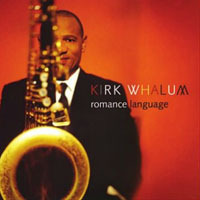 Though Kirk had achieved recognition and respect with the success of his previous releases, the 1998 release of For You cemented Kirk’s place on the Smooth Jazz Charts. For You has been Kirk’s best selling CD to date and rendered four top ten hits for Kirk. It remained on the Billboard Contemporary Jazz charts for over 65 weeks and was TOP TEN on the charts for 53 weeks! 1998 also saw the release of Kirk’s first Gospel project, The Gospel According to Jazz, Chapter One. That project received rave reviews as well as both Stellar and Dove nominations. Kirk’s 2000 follow-up to that was his second Gospel project, Hymns in the Garden, co-produced by newly signed Warner Bros. artist, John Stoddart. Kirk’s ’00 release, Unconditional again put him at the top of the charts. Now ‘Til Forever, the albums first single, hit #1. Two Grammy nominations soon followed. Kirk’s long awaited Christmas CD, The Christmas Message was released in 2001. In 2002 Kirk released the critically acclaimed Gospel According to Jazz Chapter II (on CD & DVD), which blends old-fashioned gospel with jazz styles ranging from cool-jazz? to salsa and all points in between. Kirk’s other release that year was a collaboration project with fellow WB label mates guitarist Norman Brown and trumpeter Rick Braun. The group is called BWB and the album is entitled Groovin’. This project quickly rose to the top of the Smooth Jazz charts and dominated Smooth Jazz radio for several months. Kirk signed with RENDEZVOUS ENTERTAINMENT in 2005 and released his first album for them, Kirk Whalum Performs the Babyface Songbook, to critical praise and acclaim. Kirk says that he wanted to pay tribute to one of the world’s most prolific, contemporary songwriters. Fans are eagerly awaiting the recording and release of Gospel According to Jazz Chapter lll, which will be recorded in ’07 and will again feature a DVD. Kirk’s musical accomplishments have brought him professional and critical acclaim with a total of seven Grammy Nominations and two Stellar Awards (Best Gospel Instrumental Album); it’s his benevolent spirit and charitable efforts that truly define him. Kirk has hosted numerous benefit concerts on behalf of many organizations including the Boys and Girls Club of Pasadena (CA) and the Houston Leukemia/Lymphoma Society. He is currently involved with the STROKE OF HOPE foundation-an organization that seeks to empower stroke survivors and their caregivers. As someone who loves working with young musicians, Kirk is most proud of his 2006-2008 appointment as the first Artist-in-Residence of the STAX Music Academy in his hometown of Memphis. Special Kirk Whalum Event at Stax Museum March 16th! All About Jazz musician pages are maintained by musicians, publicists and trusted members like you. Interested? Tell us why you would like to improve the Kirk Whalum musician page.